April is Autism Awareness Month: How can teachers best support students on the spectrum? Get Girls Excited About a Career in STEM! And, it’s also one of the busiest! 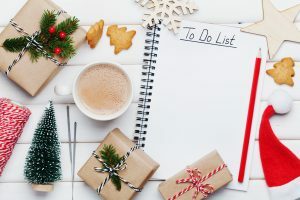 With the holidays upon us, you might find you have less time than usual to get everything done. This season, we’re here to help! Follow these five tips and you’ll have more free time to spend with friends and family, or on the activities you enjoy. Leverage In-Class Peer Grading. Students love immediate feedback, and when you review their assignment performance in class rather than at home, you have the benefit of reinforcing concepts promptly. For some assignments, like French vocabulary pop quizzes, instead of taking them home to grade, ask students to trade with the person sitting next to them immediately following the quiz, and review the answers as a class. Doing so will foster dialogue and allow you to reinforce concepts, while your grading is done for you. Voilà! Make a List — And Check It Once! The best way to get organized is to write everything down. Organize your to-dos with good old fashioned pen and paper or digital lists on your smartphone. Review your lists daily and cross things off as you go. You might even want to start your day with writing down the top five things you’d like to accomplish that day. This exercise will give you focus and a sense of accomplishment as you check off those tasks. Limit Student Homework. Teachers and students have a lot to accomplish during school hours, and when not everything gets done, it usually results in homework. During the holidays remember that you and your students might have other plans after school hours including family obligations, parties, shopping, cookies to bake, and other things to take care of. For you, consider alternative assignments to homework that requires dedicated grading, like individual or group projects to meet the required outcomes. And for students, make some homework assignments optional, for extra credit for example. Then they can get a little break too! Avoid Multitasking. Focus on being efficient, not fast. If you go too quickly or do too many things at once, you may make mistakes and then have to go back and redo your work. Instead, take a deep breath and focus on one task at a time. You’ll actually save time in the long run. Have Your Students Pitch In. Want to get your room organized before the holiday break? You’re in luck! You have plenty of help right in your classroom. Whether your students are in kindergarten or 8th grade, they can be helpful in organizing the room, their desks, lockers, etc. Set aside some time to do a winter break clean. You may be surprised that your students will actually like helping out and plus you’ll be teaching them organizational skills that they can use in life! Do you have any time saving tips for teachers? If so, please comment below!